Big Island Rachel's Books: Review: "The Amazing Adventures of Kavalier and Clay"
Review: "The Amazing Adventures of Kavalier and Clay"
We're in the middle of Passover right now. Let's celebrate by reviewing a book about Jews! Michael Chabon's "The Amazing Adventures of Kavalier and Clay" won a Pulitzer, so it's not going to be earth-shattering when I say that it is a great book. It's about the American Sam Clay and his Czech cousin Josef Kavalier, who team up in 1939 to create one of the most famous comic book superheroes ever, The Escapist. The Escapist is a Chabon invention--no such character exists in comic books--but the circumstances of his creation and the cousins' rise in the newly-created comic book industry is factual, an amalgamation of the many real artists and writers that found success and failure in this uniquely American form of art. The Escapist is an escape artist who goes around the world liberating the trapped and oppressed. The artist part of the duo, Josef Kavalier, was also an escape artist, or at least he was training to be one in Prague before he came to America. The book begins with Kavalier escaping the Nazi occupation of his city by smuggling himself out in the coffin of the Golem of Prague. The Golem of Prague is a figure from Jewish folklore, a proto-superhero that a rabbi creates out of clay and animates by carving the name of God into its forehead, in order to protect the community from people who get the itch to beat and kill their Jewish neighbors. 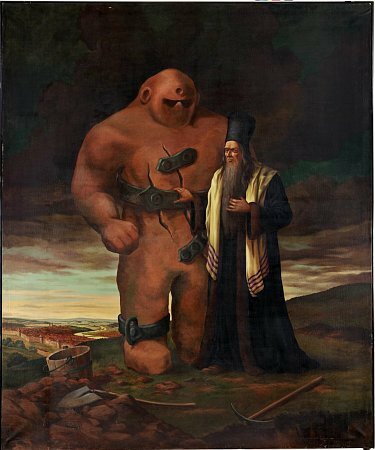 The most famous Golem was created in Prague in the 16th century by Rabbi Judah Loew ben Bezalel, and this is the Golem that Kavalier accompanies to Lithuania so the Nazis can't get their hands on either Kavalier or the Golem. His new life in America revolves around him getting enough money to get the rest of his family out of Prague and give them a new start in his adopted country. It's a short leap from there for Kavalier, with his cousin Clay, to create a superhero who continuously escapes and helps others escape from evil men. The theme of escape and liberation runs through the various events of the novel, which follows the two cousins through 20 years of love, war, and personal and professional setbacks. While I initially picked up this book because I wanted to see Chabon's take on rise of the comic book industry, I was pleasantly surprised to see how the story was about so much more than just comic books: it was about dreams, and freedom, and the inability to escape from your own basic nature, no matter how hard you try.